Explore, experiment and create using author David A. Carter's POP-UP books. Saturday 7th February 2015. 11am to 1pm. In this workshop, you'll experiment with and discover some of the techniques to make your own pop-up shapes and figures. Adults, and children over 3 years. Registration until 4th February 2015 by filling in the form or by calling 93 885 37 04. Limited places. Encouraging children to make use of different illustrated books from the Minispace. Saturday February 21st, 2015. 11 am to 1pm. An activity in which children will be given the opportunity to experiment on their own with the Minispace books . Who is it for? Children over 5 years. Registration until 18 February 2015 by filling in the form, or by calling 93 885 37 04. Limited places. Visit + family activity related to the exhibition. Saturday 7th March 2015. 11am to 1pm. Guided tour around the exhibition about co-creation, followed by a playful, creative educational activity which will go into the exhibition's content in greater detail. Who is it for? Adults, and children over 5 years. Registration until March 4th, 2015 by filling in the form or by calling 93 885 37 04. Limited places. Based around our highlighted illustrated book; the Pop-Up books by author David A. Carter. Saturday March 21st, 2015. 11am to 1pm. 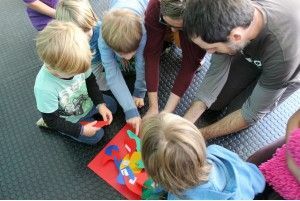 A workshop where children may learn basic techniques, and create 3D pop-up shapes on paper. Who is it for? Children over 6 years. Registration until 18th March 2015 by filling in the form or by calling 93 885 37 04. Limited places.